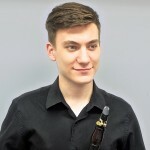 Dylan James is a music performance major at Rowan University, where he studies clarinet and holds the principal clarinet position in the University’s Wind Ensemble, Orchestra, Opera Orchestra, and Clarinet Ensemble. He is also a member of the Rowan University Clarinet Quartet and several other chamber music ensembles. As a winner of the 2014-15 Concerto Soloist Competition, he performed Weber’s Clarinet Concerto No.1 with the Rowan University Orchestra. Dylan has participated in the 2013 All-Eastern Band Festival, Hartford, CT, the Kimmel Center Chamber Music Camp, and the Northern Lights Music Festival, Aurora, MN, where he was featured as a soloist with the festival’s orchestra. He was recently selected to participate in the 2015 Kennedy Center/National Symphony Orchestra National Trustees Summer Music Institute in Washington, D.C.
Born in Butler, PA, Dylan began his clarinet studies at the age of 10 with Candy Maxwell. He is a former member of the Philadelphia Sinfonia and a past student of Settlement Music School, where he studied woodwind chamber music on scholarship with Shirley Curtiss. He has appeared as a featured soloist and as a member of the clarinet section with the Philharmonic of Southern New Jersey, under Maestro Matthew Oberstein. He is a graduate of Clearview Regional High School in Mullica Hill, NJ.